There are many problems that homeowners can face with their crawl space. Although they’re easy to forget about, it’s important to regularly check your crawl space for any signs of damage and get it repaired quickly before the problem gets worse. Their damp and humid environment doesn’t allow for much air circulation and can cause water problems to build up, which can result in many different issues. 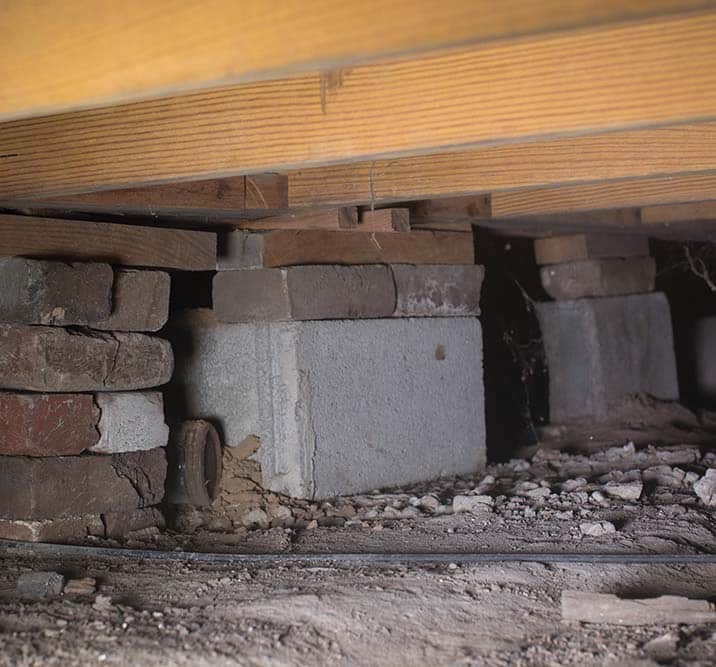 Our team at Total Foundation Solutions is very familiar with these common types of crawl space problems and can quickly find a solution for your home. If you notice any problems with your crawl space, contact our team to come fix the problem. A number of different factors can result in crawl space problems. If these problems are left untreated, the air quality and structural integrity of your home could be negatively affected. Crawl spaces are prone to water damage. They can easily flood from heavy rains, plumbing failures, or groundwater leaks. The lack of air circulation causes water to become stagnant and cause more damage over time. A flooded crawl space can create a wet, musty mess, and also lead to more serious issues like ruining fiberglass insulation, weaken wooden floor joists, or damage any electrical wiring. If you notice any water damage in your crawl space, our team at Total Foundation Solutions offers a number of crawl space solutions to fix the problem. Throughout Northwestern Pennsylvania and Western New York, we have seen the following symptoms in many crawl spaces that we have repaired. Mold is a common issue that stems from crawl space water damage. As the water sits and remains stagnant, it can spur mold growth in your crawl space. Although certain molds are more dangerous than others, any mold is considered bad mold. To prevent mold growth in your crawl space, it’s best to implement waterproofing solutions as soon as possible. As water collects on the joists and boards in your crawl space, it can cause them to rot. The rot eats away at the wood and causes it to become weak, where it can no longer support the weight of the floors above it. This structural damage can impact the inside of your home by creating uneven or sagging floors. The dark and damp nature of crawl spaces makes them the perfect environment for unwanted bugs and pests. The addition of water damage can make this problem even worse. To create an inhospitable environment for these unwanted guests, you must implement crawl space solutions that create a dry, healthy environment. Unfortunately, most crawl space problems don’t stay in your crawl space. Since your home sits on top of your crawl space, any problems in there can impact the living areas of your home. The stack effect is a phenomenon that allows the air inside your crawl space to push upward into your home. If there is any mold in your crawl space, it can create musty odors and contaminate the air inside your main living areas. Aside from poor air quality, the mold and rot on the wooden joists and boards in your crawl space can cause structural damage inside your home. As a result, the floors in your home can become uneven from the lack of support underneath. Our team at Total Foundation Solutions has proudly helped customers throughout all of Northwestern Pennsylvania and Western New York with their crawl space problems. We can easily identify problems and provide the best possible recommendation to prevent your crawl space from future damage. Contact us today for your free crawl space repair estimate!